For those who have to . . . meaning get paid to . . . shuttle folks to the airport, the cruise terminal or just around and about, GMC offers its extra-long 2012 Yukon XL Fleet Half-Ton, or Standard in GM-speak. An added 22 inches in length over standard-sized Yukons, and a wheelbase that’s some 14-inches longer, give this full-size SUV seating for nine on three-rows of bench seats, while allowing 137.4 cubic feet of cargo room with the second-row seatbacks folded and the third row removed. Should there be a full house, 49 cubic feet of luggage space is still available behind the third row. Outside, this commercial-oriented Yukon trim sports a roof rack, side steps, squared-off front fog/driving lights, a trailer hitch and wiring, and heated power-adjustable mirrors. Inside, look for vinyl upholstery, a six-way power-adjustable driver’s seat, leather, simulated wood and simulated alloy cabin trim, and full power accessories. Convenience-wise, cruise control is standard, as is tilt-wheel steering, while OnStar Directions and Connections service is bolstered by a single-CD player with six speakers. All this is kept cool, meanwhile, by tri-zone manual air conditioning with available rear controls. Further options for the Yukon XL Fleet Half-Ton trims include the deletion of the roof rack and OnStar service, as well as additions like remote engine starting, upgraded 17-inch wheels, camper-style heated power-adjustable outside mirrors, skid plates, premium cloth upholstery, front bucket seats (eight passengers) and roof-rack center rails. A heavy-duty towing package is also available, as are an integrated trailer brake controller and rear parking sensors. Powering this rear-wheel-drive (RWD), work-oriented sport ute is the same 5.3-liter V8 engine as its more consumer-oriented Half-Ton siblings. Boasting variable valve timing (VVT) and flex-fuel capability (FFV), this peppy V8 combines with the standard six-speed shiftable automatic transmission for 320 hp and 335 lb-ft of torque. Towing is maxed out at 8,100 pounds with the available heavy-duty tow package installed, while mileage is estimated at 15 mpg city/21 highway. Standard safety features, finally, include, of course, this Jimmy’s massive heft, as well as four-wheel antilock brakes (ABS), traction and stability control, front side-mounted airbags and three-row head airbags. Additionally, daytime running lights, OnStar emergency assist, a post-collision safety system and a remote anti-theft alarm all come standard, with front fog/driving lights remaining optional. Flaunting an additional 22 inches in overall length and a wheelbase that’s 14 inches longer than standard-size Yukon contemporaries, the 2012 GMC Yukon XL (extra length) Fleet Three-Quarter-Ton full-size SUV is for the dedicated runs that make owner’s money. Able to tote up to nine folks on three rows of bench seats, this over-sized sport ute also flaunts 137.4 cubic feet of cargo area with the second-row seatbacks folded and the third row removed. Powering this oversized rear-wheel-drive beast is a 6.0-liter engine that’ll put out 352 hp, and boasts variable valve timing (VVT) and ethanol-capable flex fuel technology (FFV). The standard six-speed shiftable automatic transmission has been tweaked for a little extra towing muscle, allowing 382 lb-ft of torque to haul some 9,600 pound of trailer with the standard heavy-duty hitch and wiring, which also includes an included integrated trailer brake controller. Gas mileage, however, is a woeful 10 mpg city/16 highway. A roof rack, side steps, 17-inch steel wheels, all-terrain tires and heated power-adjustable mirrors, meantime, decorate this stretched-out Yukon’s profile, with the cabin flaunting vinyl upholstery, a power driver’s seat, leather, simulated wood and simulated cabin accents, and full power accessories. Convenience bling includes cruise control, tilt-wheel steering and OnStar Directions and Connections services, while entertainment is presented via a single-CD player with six speakers. Options for the 2012 Yukon XL Fleet Three-Quarter-Ton include OnStar delete and/or deletion of the roof rack, while upgraded 17-inch wheels, premium cloth upholstery, heated power-adjustable camping-style outside mirrors, front bucket seats (eight-passenger capacity) with front console, and remote engine starting. Skid plates, finally, as well as rear parking sensors, also can be delivered with this hefty Jimmy. Finally, this big Yukon Fleet trim might be one of the biggest things on the road, but it still packs standard four-wheel antilock brakes (ABS), traction and stability control, front side-mounted airbags and three-row head airbags. It also totes such added safety equipment as daytime running lights, a post-collision safety system, OnStar emergency assistance and communications and a remote anti-theft alarm. Front fog/driving lights, meanwhile, remain optional. The base trim of GMC’s 2012 Yukon XL (extra length) lineup is the SLE Half-Ton, aka the SLE 1500. Big and bold, able to seat eight people in quasi-posh comfort, boasting V8 power and class-leading cargo capacity (137.4 cubic feet with the second-row seatbacks folded and the third row removed), this full-size SUV takes on the road with rear-wheel-drive (RWD) traction admirable cruising manners and remains some 22 inches longer than its standard Yukon cousins, with a 14-inch longer wheelbase. Flaunting its standard variable-valve-timed (VVT) and Flex Fuel (FFV) 5.3-liter V8 powerplant, this base Yukon XL uses a six-speed shiftable automatic transmission to ensure 320 hp and 335 lb-ft of torque. Able to tow up to 8,100 pounds of trailer with the standard hitch and wiring, this entry-level ½-ton sport ute also takes it relatively easy on the fuel budget with mileage numbers estimated at 15 mpg city/21 highway. Decorating the outside of the Yukon XL SLE Half-Ton are 17-inch alloy wheels, a roof rack, step running boards and heated power-adjustable mirrors. Inside, look for premium cloth upholstery, power-adjustable front seats, second-row bench seats full power accessories, and simulated wood and simulated alloy cabin accents. Further standard goodies adorning this entry-level half-ton trim include tri-zone climate control monitored by Sun Sensor technology, as well as a leather and simulated alloy steering wheel, OnStar Directions and Connections technology, and Bluetooth hands-free calling. Convenience features, meanwhile, include cruise control, an auto-dimming rearview mirror and tilt-wheel steering, while entertainment is offered via a single-CD player boasting nine Bose premium speakers, satellite radio and a USB connection. Options for the oversized Yukon XL SLE Half-Ton include remote engine starting, an integrated trailer brake controller, heavy-duty tow hitch and wiring, upgraded 20-inch wheels, rear parking sensors, remote engine starting, second-row captain’s chairs, a power sunroof and rear-seat DVD entertainment. Notable standard safety features for this stretched-out ute, besides sheer heft, include four-wheel antilock brakes (ABS), traction and stability control, front side-mounted airbags and three-row head airbags. Daytime running lights, a post-collision safety system and a remote anti-theft alarm also come standard, as does OnStar emergency assistance and communications. When nine people have to get to the airport . . . or the ball . . . in the middle of a snowstorm and want the safety and security of a full-sized SUV doing it, they might look to the 2012 GMC Yukon XL Fleet Half-Ton 4WD, Jimmy’s only fleet-designated four-wheel-drive (4WD) Yukon XL. Sporting part-time 4WD to go with three-rows of bench seating (for nine passengers) and V8 power, this big ute additionally can handle up to 137.4 cubic feet of cargo with the second-row seatbacks folded down and the third row removed. If the whole gang’s going along, there’s some 49 cubic feet of space available behind the third row for luggage. All this toting territory comes courtesy of an extra 22 inches of length over the standard-size Yukon, along with an additional 14 inches of wheelbase stretch. 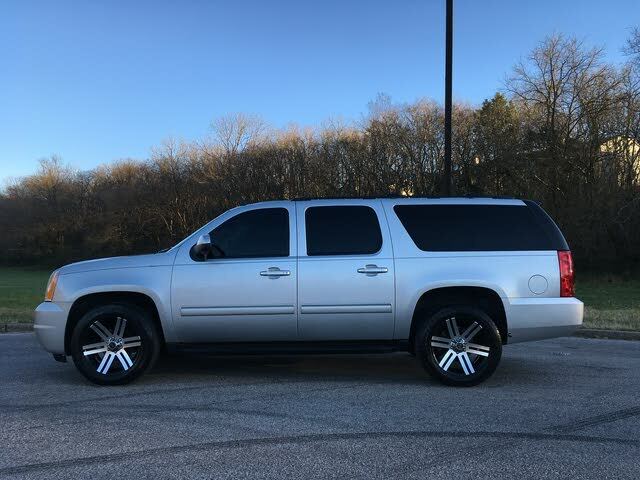 Marginal downgrades to the usual amenities in the Yukon XL (extra length) Fleet trims are common as compared with their more consumer-oriented contemporaries, and include 17-inch steel wheels, as opposed to alloy wheels, vinyl upholstery versus premium cloth, and front bench seating sans a front console. Otherwise, this all-business Jimmy comes with the roof rack, heated power-adjustable mirrors, side steps, and the trailer hitch and wiring that adorns the profile of its equally handsome peers, as well as a power-adjustable diver’s seat, full-power accessories and the leather, simulated wood and simulated cabin accents found in its full-featured siblings. Cruise control, tilt-wheel steering and OnStar Directions and Connections service also come standard in this oversized Jimmy, as does manually operated tri-zone air conditioning with available rear controls, with a single-CD player boasting six speakers pumping out the tunes. Options in the Yukon XL Fleet Half-Ton 4WD include OnStar delete and/or roof-rack delete, along with the addition of upgraded 17-inch wheels, a heavy-duty tow package, an integrated trailer brake controller, heated power-adjustable camper-style outside mirrors, remote engine starting and front bucket seats (for eight-passenger capacity). Premium cloth upholstery is also available, as are a roof-rack center rail, rear parking sensors and skid plates. The 5.3-liter V8 powerplant that moves the consumer-oriented Yukon XL Half-Ton (1500) sport-ute is reprised in the Fleet version. Boasting variable valve timing (VVT) and Flex Fuel (FFV) flexibility, this competent V8 mates with the standard six-speed shiftable automatic transmission to put out 320 hp and 335 lb-ft of torque. Towing is maxed out at 8,000 pounds with the available heavy-duty towing package, while mileage is estimated at 15/mpg city/21 highway. Oh, and the standard 4WD system is reasonably off-road-ready with an electronically controlled two-speed transfer case and auto-locking hubs. Though it’s big and brash, the 2012 Yukon XL Fleet Half-Ton still sports, with four-wheel anti-lock brakes (ABS), and traction and stability control, front side-mounted airbags and three row head airbags, all the stuff that today’s safety-conscious owner desires. Additionally, this behemoth boasts daytime running lights, OnStar emergency assistance, a post-collision safety system and a remote anti-theft alarm system. Finally, front fog/driving lights are an available safety option. Stretched some 22 inches longer than its standard size brethren, the 2012 GMG Yukon XL (extra length) SLE Three-Quarter-Ton full-size SUV also totes a 14-inch longer wheelbase, all adding up to room for eight-passengers in three rows and, with the second row seatbacks folded and the third row removed, 137.4 cubic feet of cargo area. Powering the super-sized Yukon XL SLE Three-Quarter-Ton, aka the XL SLE 2500, is a variable-valve-timed (VVT), Flex Fuel (FFV) 6.0-liter V8 engine that combines with an enhanced six-speed shiftable automatic transmission for 352 hp, 382 lb-ft of torque and some added towing muscle. Mileage is estimated at a woeful 10 mpg city/16 highway in this rear-wheel-drive (RWD) behemoth, but towing is maxed out at a respectable 9,600 pounds with the standard heavy-duty trailer hitch and wiring, as well as the delivered integrated trailer brake controller. Outside, this base trim sports 17-inch alloy wheels, all-terrain tires, a roof rack, skid plates, step running boards, an auxiliary transmission cooler and heated power-adjustable mirrors. Inside bling, meantime, includes premium cloth upholstery, power-adjustable front seats, a second-row bench seat and full power accessories. Then there’s leather, simulated wood and simulated alloy cabin trim and Sun-Sensor-monitored three-zone auto climate control to class up the joint, as well as cruise control, tilt-wheel steering and an auto-dimming rearview mirror adding to convenience. Entertainment, finally, consists of a single-CD player pounding tunes out of nine Bose premium speakers, all bolstered by satellite radio and a USB connection. Options-wise, look for remote engine starting, a power sunroof, upgraded rear-seat DVD entertainment, upgraded 20-inch wheels, rear parking sensors, and second-row captain’s chairs that reduce total passenger capacity to seven. Besides sheer mass, noteworthy standard safety features aboard the lengthy Yukon XL SLE Three-Quarter-Ton include four-wheel antilock brakes (ABS), traction and stability control, front side-mounted airbags and three-row head airbags. Additional standard safety equipment includes daytime running lights, a post-collision safety system and a remote anti-theft alarm. Finally, OnStar emergency communications and assistance also comes delivered in this stretched Jimmy. Not only is the 2012 GMC Yukon XL Fleet Three-Quarter-Ton 4WD full-size SUV some 22 inches longer than its standard-size Yukon peers, with a 14-inch longer wheelbase, but, with three rows of bench seats, it’s designed to get eight-folks plus the driver to the airport, the theater or the movie set in quasi-pampered comfort. The “XL” designation stands for “extra length”, thus this outsize sport ute packs 137.4 cubic feet of cargo behind the front seats when the second-row seatbacks are folded and the third row removed, while cargo space to the upright third row stands at a respectable 49 cubic feet. As its moniker additionally implies, this oversized sport ute comes with standard four-wheel drive (4WD), while the delivered 6.0-liter V8 powerplant will churn out 352 hp. A standard six-speed shiftable automatic transmission, meantime, manages 382 lb-ft of torque, and is tweaked for a towing capacity of 9,400 pounds with the standard heavy-duty hitch and wiring. Owners also gain the confidence of an integrated trailer brake controller with the beefed-up towing package, while the off-road-capable part-time 4WD system boasts electronic hi-lo gear selection and auto-locking hubs. Standard appearance goodies for the 2012 Yukon XL Fleet Three-Quarter-Ton 4WD include a roof rack, side steps, 17-inch steel wheels and heated, power-adjustable mirrors. Inside, look for vinyl upholstery, a power-adjustable driver’s seat, full power accessories and leather, simulated wood and simulated alloy cabin accents, with cruise control, tilt-wheel steering and GM’s touted OnStar Directions and Connections technology adding a to the convenience factor. Meantime, entertainment is offered by the standard single-CD player with six speakers. Options-wise, this stretched ute can be delivered with front bucket seats (for eight-passenger capacity), a front console, remote engine starting, skid plates, upgraded 17-inch wheels, premium cloth upholstery, heated power-adjustable camping-style exterior mirrors, and rear parking sensors. OnStar and/or the roof rack can also be deleted as part of the options offerings. Notable standard safety features obviously begin with this hefty ute’s sheer size. Nevertheless, this heavy hauler sports such standard safety equipment as four-wheel antilock brakes (ABS), traction and stability control, front side-mounted airbags and three-row head airbags. Daytime running lights, OnStar emergency assistance communications, a post-collision safety system and a remote anti-theft alarm also come standard, while front fog/driving lights can again be added as a safety option. Boasting an additional 22 inches in total length, as well as a longer wheelbase than its standard-size peers, the 2012 GMC Yukon XL SLE Half-Ton . . . or XL SLE 1500 4WD, if you prefer . . . is the base trim in the stretched-out XL (extra length) lineup. This full-sized SUV offers seating for up to eight passengers in three rows, V8 power, loads of standard goodies and, as its moniker implies, part-time four-wheel drive (4WD). Unlike its all-wheel-drive XL Denali siblings, this off-road-capable 4WD system offers a two-speed transfer case and auto-locking hubs, while cargo area remains a class-leading 137.4 cubic feet with the second row seatbacks folded and the third row seats removed. Powered by a standard variable-valve-timed (VVT), Flex Fuel (FFV) 5.3-liter V8 engine, this hefty sport ute is good for 320 hp and, managed by the standard six-speed shiftable automatic transmission, 335 lb-ft of torque. Towing is maxed out at some 8,000 pounds, while mileage is estimated at 15 mpg city/21 highway. Standard appearance goodies decorating this stretched-out base Yukon XL trim include 17-inch alloy wheels, a roof rack, a trailer hitch and wiring, step running boards and heated power-adjustable mirrors. Inside, look for premium cloth upholstery, power-adjustable front seats, second-row split-folding bench seats and full power accessories. Further cabin bling includes leather, simulated wood and simulated alloy accents and tri-zone auto climate control monitored by Sun Sensor technology. For convenience, this big sport ute boasts cruise control, tilt-wheel steering and an auto-dimming rearview mirror, while entertainment is offered via a single-CD player with nine Bose premium speakers, satellite radio and a USB port. Finally, OnStar Directions and Connections service mates with Bluetooth hands-free technology to keep everyone on target and in touch. Options, meantime, include remote engine starting, rear parking sensors, remote engine starting, a heavy-duty trailer hitch and wiring with integrated trailer brake controller, a power sunroof, upgraded 20-inch wheels, rear-seat DVD entertainment and second-row captain’s chairs for seven-passenger total seating. Standard safety equipment aboard the Yukon XL SLE Half-Ton 4WD, besides its massive size, includes four-wheel antilock brakes (ABS), traction and stability control, front side-mounted airbags and three-row head airbags. Further standard safety stuff includes OnStar emergency assistance and communications, daytime running lights, a post-collision safety system and a remote anti-theft alarm. Add some 22 inches of overall length and some 14 inches to the wheelbase of the standard-size GMC Yukon to behold the 2012 Yukon XL (extra length) SLT Half-Ton full-size SUV. This super-sized midlevel trim will seat eight passengers comfortably and boasts some 137.4 cubic feet of cargo space with the second-row seatbacks folded and the third row bench seat removed. Powered by the variable-valve-timed (VVT), Flex Fuel 5.3-liter V8 engine, and managed by a shiftable six-speed automatic transmission, this hefty rear-wheel-drive (RWD) ute throws down 320 hp and 335 lb-ft of torque, and can tow up to 8,100 pounds of trailer with the available heavy-duty towing equipment installed. The standard hitch and wiring combo allows, meanwhile, some 5,100 pounds of towing capacity, while mileage is estimated at 15 mpg city/21 highway. Outside, this midlevel sport ute trim flaunts 17-inch alloy wheels, a roof rack, side steps, a roof rack and heated power-adjustable mirrors. Inside, there’s standard leather upholstery, power-adjustable front seats, full power accessories, including power-adjustable pedals, and leather, simulated wood and simulated alloy cabin accents. Cruise control, an auto-dimming rearview mirror and tilt-wheel steering are a couple of standard convenience features, with all complemented by a standard universal remote garage door opener, remote engine starting, rear parking sensors and a rearview camera with seven-inch display. Standard comfort amenities in the 2012 Yukon XL SLT Half-Ton, meanwhile, include three-zone auto climate control monitored by Sun Sensor technology, as well as entertainment via a single-CD player, nine Bose premium speakers, satellite radio and a USB connection. OnStar Directions and Connections service, complemented by Bluetooth hands-free calling, is also delivered in this loaded-up ute. Options-wise, look for a newly upgraded hard-drive-based navigation system with up-sized display, as well as rear-seat DVD entertainment, 20-inch upgraded wheels, an integrated trailer brake controller, GM’s Autoride Active Suspension System, and a power sunroof. Additionally, the standard second row bench seat can be deleted in favor of available captain’s chairs for seven-passenger total capacity. Notable standard safety features include four-wheel antilock brakes (ABS), traction and stability control, three-row head airbags and front side-mounted airbags. Also standard are daytime running lights, front fog/driving lights, a blind spot warning system, OnStar emergency assistance and communications, a post-collision safety system and a remote anti-theft alarm. As can be inferred from its descriptive moniker, GMC’s 2012 Yukon XL SLE Three-Quarter-Ton 4WD full-size SUV (aka the XL SLE 2500 4WD) offers part-time four-wheel drive (4WD), while the XL (extra length) moniker denotes 22 more inches of length and a wheelbase that’s 14 inches longer than standard-size Yukon trims. This base edition, therefore, can seat up to eight and flaunts a class-leading 137.4 cubic feet of cargo area with the second-row seatbacks folded and the third row bench seat removed. A variable-valve-timed (VVT), Flex Fuel (FFV) 6.0-liter V8 powerplant mates with a towing-tweaked six-speed shiftable automatic transmission for 352 hp and 382 lb-ft of torque that’s good enough to haul up to 9,400 pounds of trailer using the standard heavy-duty tow hitch and wiring, integrated trailer brake controller and 3.42 rear axle ratio. Mileage takes a dive to 10 mpg city/15 highway, but there’s the confidence of part-time 4WD traction via an electronic two-speed transfer case and auto-locking hubs. The 17-inch alloy wheels and all-terrain tires adorning this outsized Jimmy’s profile are complemented by a roof rack, side steps and heated power-adjustable mirrors, while premium cloth upholstery, power-adjustable front seats, leather, simulated wood and simulated alloy cabin accents, and full power accessories grace the well-wrought cabin. Standard convenience features, meantime, include cruise control, tilt-wheel steering and an auto-dimming rearview mirror, while all of this is cooled via three-zone auto climate control that’s monitored by Sun Sensor technology. OnStar Directions and Connections service also comes with the well-wrought Yukon XL SLE Three-Quarter-Ton 4WD, as does Bluetooth hands-free communications, a single-CD player, nine Bose premium speakers, satellite radio and a USB port. Options include remote engine starting, upgraded 20-inch wheels, second-row captain’s chairs (for seven-passenger seating), a power sunroof, rear parking sensors and rear-seat DVD entertainment. Finally, this winter-beating sport ute flaunts, besides its looming size, such standard safety features as four-wheel antilock brakes (ABS), traction and stability control, front side-mounted airbags and three-row head airbags. Further safety equipment includes daytime running lights, a post-collision safety system, OnStar emergency assistance and communications, and a remote anti-theft alarm, all standard. Supersized and superbly equipped, the 2012 GMC Yukon XL (extra length) SLT Three-Quarter-ton full-size SUV hauls people, payload and ponies with equal aplomb. Some 22-inches longer than the standard-size Yukon offerings and with an added 14-inches of wheelbase, this midlevel trim can handle up to eight passengers in three rows of seating, sports 137.4 cubic feet of cargo area with the second-row bench seat folded and the third-row removed, and will tote a hefty 9,600 pounds of trailer with the standard heavy-duty towing hitch and wiring complemented by an integrated trailer brake controller. Powering the rear-wheel-drive (RWD) Yukon XL SLT Three-Quarter-Ton, known in some quarters as the SLT 2500, is a 6.0-liter variable-valve-timed (VVT) Flex Fuel (FFV) V8 engine that’s good for 352 hp. Mated with a shiftable six-speed automatic transmission that’s tweaked for extra towing muscle, this sizeable V8 throws down 382 lb-ft of torque but, at an estimated 10 mpg city/16 highway, gas mileage suffers a major meltdown. Anyhow, 17-inch alloy wheels, a roof rack, step running boards and heated power-adjustable mirrors drape this big ute’s handsome profile, while leather upholstery, power-adjustable front seats, power-adjustable pedals, full power accessories and leather, simulated alloy and simulated wood accents adorn the cabin. Cruise control is, of course, standard, as is tilt-wheel steering, a universal remote garage door opener, rear parking sensors, remote engine starting, a rearview camera and an auto-dimming rearview mirror. Meantime, all of this bling is favored with tri-zone auto climate control managed by Sun Sensor technology, while OnStar Directions and Connections service is bolstered by Bluetooth hands-free calling while, entertainment-wise, the 2012 Yukon XL SLT Three-Quarter-Ton boasts a single-CD player with nine Bose premium speakers, satellite radio and a USB connection. If all that isn’t enough, this oversized heavy hauler can be delivered with an available (and upgraded for 2012) hard-drive-based navigation system flaunting a seven-inch display, as well as a power sunroof, upgraded rear-seat DVD entertainment, and the load-leveling Autoride Active Suspension System Then there are optional 20-inch upgraded wheels, and second-row captain’s chairs that reduce passenger capacity to seven. Lastly, standard safety equipment such as four-wheel antilock brakes, traction and stability control, front side-mounted airbags and three-row head airbags supplement this brute’s hefty size. Further safety features, meantime, include daytime running lights, front fog/driving lights, OnStar emergency services, blind spot warning alarm, a post-collision safety system and a remote anti-theft alarm. Stretch an already good-sized GMC Yukon full-size SUV, throw in a bunch of extra standard features and mix with delivered V8 power and part-time four-wheel drive (4WD) to behold the 2012 Yukon XL (extra length) SLT Half-Ton 4WD. Known in some circles as the XL SLT 1500 4WD, this midlevel trim, like all of its XL siblings is 22 inches longer than its standard Yukon counterparts and comes with a 14-inch longer wheelbase. Thus, it seats up to eight people with the standard second- and third-row bench seats, while offering 137.4 cubic feet of cargo capacity with the second row seatbacks folded and the third row seat removed. 8,000 pounds with the optional heavy-duty towing package added, while mileage is estimated at 15 mpg city/21 highway. Meantime, the off-road-capable 4WD system boasts an electronically controlled two-speed transfer case and auto-locking hubs. Decorating this midlevel trim’s profile are 17-inch alloy wheels, a roof rack, step running boards, heated power-adjustable mirrors, and a trailer hitch and wiring. Inside, the SLT Half-Ton 4WD sports leather upholstery, power-adjustable front bucket seats, full power accessories, power-adjustable pedals, and leather, simulated wood and simulated alloy cabin accents. All of this remains embraced by tri-zone auto climate control monitored by Sun Sensor technology. Standard convenience features, meanwhile, include cruise control, tilt-wheel steering, an auto-dimming rearview mirror, universal remote garage door opener, rear parking sensors, remote engine starting and a rearview camera. Again, the 2012 Yukon SLT Half-Ton 4WD comes with standard OnStar Directions and Connections service, as well as Bluetooth hands-free communications and a single-CD player with nine premium Bose speakers, satellite radio and a USB port. Options include a power sunroof, a newly upgraded hard-drive-based navigation system with seven-inch display, upgraded rear-seat DVD entertainment, upgraded 20-inch wheels, GM’s touted Autoride Active Suspension System and a heavy-duty towing package with integrated trailer brake controller. Finally, notable standard safety features in this oversized sport ute include, besides sheer size, four-wheel antilock brakes (ABS), traction and stability control, front side-mounted airbags and three-row head airbags. Further standard safety equipment includes daytime running lights, front fog/driving lights, blind-spot warning, OnStar emergency services, a post-collision safety system and a remote anti-theft alarm. Need an eight-passenger, four-wheel-drive-equipped (4WD) full-size and stretched-out SUV to haul people, goods and trailers around the backwoods? Check out GMC’s 2012 Yukon XL (extra length) SLT Three-Quarter-Ton 4WD with its 22 inches of added length and 14 inches of extra wheelbase over its standard-size Yukon contemporaries. All that stretch means, obviously, a roomier cabin with seating for eight in three rows, as well as 137.4 cubic feet of cargo area with the second row bench seats folded and the third row removed. Of course, standard V8 power means added towing muscle and the part-time 4WD system boasts off-road-ready electronic hi-lo gearing and auto-locking hubs. The aforementioned 6.0-liter V8 powerplant flaunts variable valve timing (VVT), Flex Fuel capability (FFV) and, mated with the trailer-towing-tweaked six-speed shiftable automatic transmission, 352 hp and 382 lb-ft of torque. Look for 9,400 pounds of max towing capacity from this rugged 4WD ute, but mileage might be a deal-breaker at a mere 10 mpg city/15 highway. In any case, appearance bling in the midlevel Yukon XL SLT Three-Quarter-Ton 4WD, which many know as the XL SLT 2500, includes 17-inch alloy wheels, a roof rack, side steps, a heavy-duty towing package with integrated trailer brake controller, and heated power-adjustable mirrors. Standard cabin features, meantime, include leather upholstery, power-adjustable front seats, full power accessories, including power-adjustable pedals, and leather, simulated alloy and simulated wood interior accents. Sun-Sensor-monitored tri-zone auto climate control, meantime, keeps things cool, while OnStar Directions and Connections service, as well as Bluetooth hands-free calling keeps folks on course and in touch. Standard convenience features include cruise control, rear parking sensors, an auto-dimming rearview mirror, universal remote garage door opener, remote engine starting and a rearview camera, while entertainment is offered via a single-CD player with nine Bose premium speakers, satellite radio and a USB port. A power sunroof is optional in the 2012 Yukon XL SLT Three-Quarter-Ton 4WD, as are, 20-inch upgraded wheels, GM’s Autoride Active Suspension System, and an upgraded hard-drive-based navigation suite with seven-inch display. A newly tweaked rear-seat DVD entertainment and second-row captain’s chairs that cut total capacity to seven passengers are also available. Noteworthy standard safety features, finally, include, besides this ute’s dominating size, four-wheel antilock brakes (ABS), traction and stability control, three-row head airbags and front side-mounted airbags. Further standard safety equipment includes daytime running lights, front fog/driving lights, a blind-spot warning system, OnStar emergency assistance, a post-collision safety system and a remote anti-theft alarm.